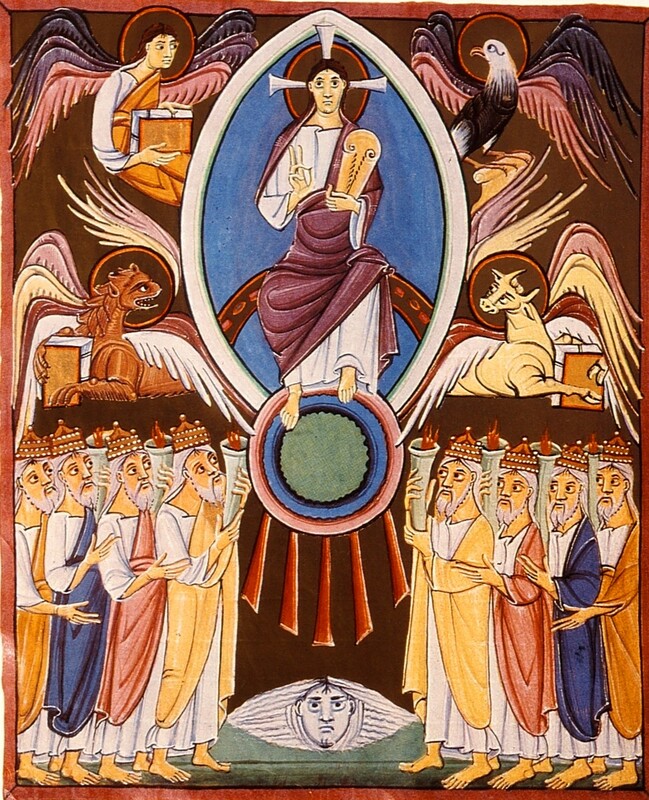 Throne of God with Elders and Four Evangelist symbols from the Bamberger Apocalypse which are illuminated manuscripts containing the Book of Revelation and a Gospel Lectionary. They were created the early 11th century, in Germany. They are currently held at the Staatsbibliothek Bamberg. Christ sits floating in the centre in a pantocrator position. There are four beasts that surround him- symbols for the four evangelists. Below are eight elders which look up to Jesus. The lines in the painting draw your eye to the centre, where Christ is. Every beast and man is looking to him. The brown and blue background complements each other, however, the blue emphasis Christ. The work is also structured so that the more important figures are bigger and at the top, and the less important are below. The painting is also very symmetrical. The colours of the elder’s robes mirror each other.